Powdered wigs and inner judges. The Kii Three applies advanced digital signal processing to ubiquitous speaker issues. Lower louder bass from a smaller box by going active? Check. That's actually the standard for recording studio monitors. 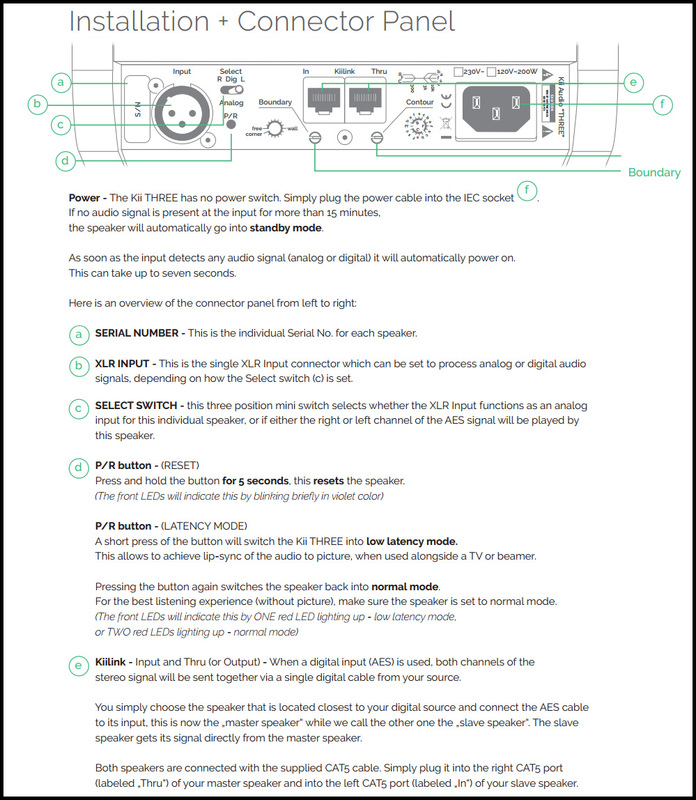 It explains the Three's AES/EBU port (S/PDIF needs an adaptor) as well as tiny trim pots. Digital filters for higher precision in the time domain? Check; but a lot more than that1. DSP for linearity control? Check. DSP for user adjustments to bass gain and EQ contour? Check. 'Excess' drivers in multiple directions fronting potent mono amps to manipulate desired dispersion? Check. 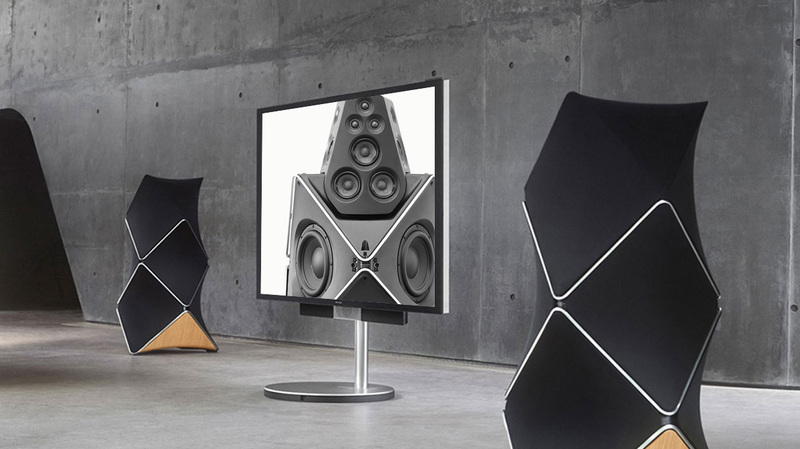 Here the Kii goes beyond most active predecessors even if with its 18 drivers, 8'200 watts of built-in active drive and smartphone control app, the B&O Beolab 90 does something conceptually related if scaled up. For many its cosmetics will be problematic, its €70'000 tag still more so. More relevant to this discussion, Bang & Olufsen are a corporate giant with concomitant engineering and fiscal resources. Kii Audio are five guys in a small workshop. Yet they've managed to tackle core issues, then arrived at a far smaller actual and aesthetic footprint and brought it in for 1/7th the coin. Obviously their Three will run out of gas well before the Great Dane if set to max free-field bass boost then played too loud. Our 100m² review space will check whether that's more of a theoretical than real issue. Given DSP control, overdrive won't cause distortion, just kick in an excursion limiter. Instead of distort, it'll mean short-term dynamic compression. But then, the Thrii is a small speaker. Only morons and headbangers expect a sustained 20Hz bass at 100dB. Plus, the nomenclature predicts bigger badder future models in an eventual Kii Two and One. 1 "The only traditional crossover point in the filter is between midrange and tweeter at 2kHz. Below that it's quite the game with overlapping frequency bands to shape the wave front. This is why we say that the filter is not comparable to a classic crossover filter. 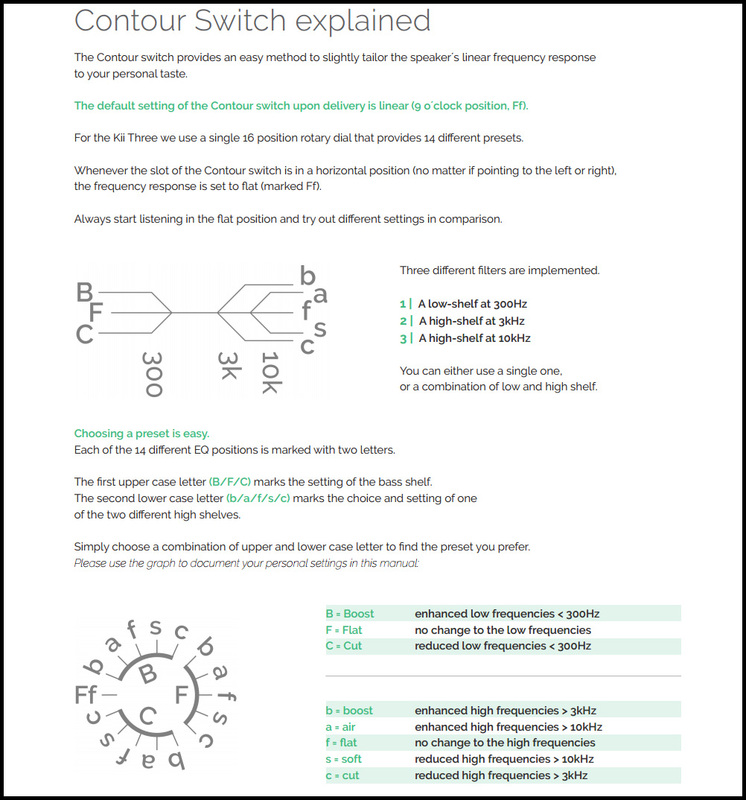 In this design, the concept of crossover frequency is not defined." The analog input caters to turntable users and legacy 'philes who may wish to use their existing front ends. (Click here for details on the Kii Three rear panel.) Until the launch of the digital controller, digital disc spinners in fact couldn't connect direct. They lacked control over volume. Here one imagines the limitations of a small outfit that perhaps was too keen to launch at the Munich HighEnd 2015 show, off-site in a downtown Munich recording studio. A year later the vital completer2 that became the controller was still unavailable. Cynics invoke déjà vu. It took Mola Mola two extra years to be in actual production whilst their OEM nCore 1200 clients were already selling and getting reviewed. Finally it's fair to mention that not all of Kii Audio's public show presentations were unanimous hits. Of course few hifi manufacturers triple-task as retailers and setup experts like Living Voice's Kevin Scott. They lack the necessary expertise. Engineering brilliance does not equal setup experience. No matter how promising a concept is on paper, chances are that actual show demos will always fall short. To really know requires a careful in-home or expert dealer demo whose presenter took the time to get to know the product, room and associated hardware, then learnt how to make it all go the extra mile. 24 hours in a hotel room are rarely enough. Just so, 'good enough' should be far easier and quicker than normal given the Three's unusual dispersion pattern. Then EQ flexibility promises instant fine-tuning far more strategic (and reversible) than component/cable swaps. Here it seemed sensible to think that the desired front-wall cancellation could be most effective if the speakers weren't toed in? 2 The €1'090 Kii Control adds lossless volume control inside the existing DSP; mute and dim functions; touch-switches for input selection; 24/192 S/PDIF and Toslink inputs; and 24/384 PCM plus DSD128 USB. A larger controller to be released later would add wireless and more. January 9th update. Checking in with CEO Chris Reichardt, "indeed, we are waiting for the Kii Control before we send your review pair. Beta testing is ongoing right now and as it looks today, shipping will start end of January. We will send you a pair in the new Graphite Satin Metallic finish that has become a new standard color besides white. Please bear with us as we finish the Kii Control." To anyone running the numbers, it's obvious. For all its surprising hardware density, the Kii Three can't run exotic drivers. Whatever parts budget a classic passive two-way in a box this size spends on four drivers, the Kii divides across a total of twelve plus dedicated amps for each plus D/A and A/D converters, never mind proprietary DSP that's not free either. Some will wonder whether software steering, active drive and controlled dispersion can categorically outshine more hi-tech drivers; or whether the Three's transducers create a built-in limit which no amount of DSP can overcome. That's an open question. We simply acknowledge that for €9'995/pr in this configuration, one cannot expect premium ScanSpeak and AudioTechnology units. By March 3rd, I had word from Kii's production and sales manager Thomas Jansen. My loaners would ship the following day. 22 months after I'd heard the prototypes in an offsite location during HighEnd Munich 2015, I would finally host the commercial product in a familiar environment. The just released Controller had not only added the vital USB input3 and lossless volume. It also had broadened the boundary/compensation facilities and allowed creation of presets. The Kii Three now included a digital preamp conveniently powered through its CAT5 connection with the master speaker. By now it ought to be abundantly clear. Calling the Kii Three a speaker is categorically wrong. Minus a source, it's a complete very advanced system. It may look like a speaker but goes beyond even contemporary actives. Really, hifi of 2017 had as yet no proper term to include all of its functionality. Being first of a new breed is disruptive. It stirs up controversy, protests over its ambitious claims4 and belly aches from attentive competitors whose intellectually more primitive passive creations may have to hide behind unwieldy facades, floor-bending weight and criminal price tags to keep up. Just another day in the hifi office? 3 Given USB's traditionally accepted 5-metre limit, most installations should use the Controller as a wired remote right next to the listening chair. For those with insufficiently long cables or where easy manual access to the Controller is out for other reasons—it is wired after all and if into multiple sources, with three or more cables that will run across the floor—the IR connection with Apple's wand or other RC5 remotes bridges the gap. Now the Controller might sit on a hutch next to your source and your infrared remote just aims at it. What could be more minimalist and modern? 4 For the technically inclined, this AudioExpress report attempts to reverse-engineer the Kii Three in Delft's anechoic chamber and measures that it behaves exactly as claimed. What would be just another day in the hifi office is an overview of traditional compact high-performance monitors from the likes of Apertura, Crystal, Enigma, Kaiser, Kroma, Magico, Stenheim, Wilson-Benesch and others. They use exotic drivers of Beryllium or graphene with ESL or AMT tweeters, ultra-costly crossover parts from Duelund & Co., expensive cabs of synthetic stone, carbon-fibre, aluminium or Panzerholz. Their pricing spans from just below €10'000/pr to €50'000. There's no arguing their quality nor that theirs is a last-century analog concept pushed to the max with modern materials. For the price of their most cost-effective example, Kii offer a 21st-century digital concept which behaves not just differently but, not to mince words, far more intelligently. It's a more advanced product, period. And unlike their kind which relies on external amplification, source selection and volume control, the Thrii packs the lot in its high-density polyurethane cab and Controller. If that doesn't get your cogs spinning, you must be out to lunch.